All true Luke, but atheism, going by my observations, can be just another form of dogmatic religion. The atheist zealot Richard Dawkins a prime case in point. Exactly my point–I used atheist organizations as an example of a group of organized humans opposed to religion (the group, religion, CJ points out in the graphic leading the blog)–the very antithesis of atheist’s supposed “cause”– becoming its own religious type entity in the process. Dawkins is a great example of an evangelist for atheists, promoting the atheist “faith” and defending its beliefs–i.e. a religion. And, the greater point–that religious organizations of all types–theists and atheists–are not the only groups practicing sacrilegious acts against humanity. Communism failed–the rich and powerful remained in control and inflicted atrocities like Stalin’s purge against the peasants in Russia (former USSR) while organized around the idea of redistributed wealth and power. Socialism continues to stagger under the same weight of the empowerment of the few leading to pain for the many. Capitalists, free-market democracies led by the richest (or pawns of the richest) in their society inflict everything from slavery, racism, prejudice and even murder while the upper 1% of the wealthy grow richer. Non-profit organizations–including religions (even though many religions clearly have a profit motive)–aspire to make the world a better place while clandestinely, and in some cases openly, practice the very same harmful acts they pledge to protect people from–all for the benefit of a few people’s self-interests. And, please note, these are not Christian-only religions–there are many types of religions practicing hypocrisy and inhumanity. Corporations ruin the earth, lie, and are criminal in their behavior to pursue the insatiable greed of its shareholders–specifically the largest shareholders (have you ever seen a group of shareholders say, “We are making way too much money”?) Never satisfied with what they have fueled by the desire for more, more and more they pollute the earth and society, inhumanly inflicting damage on their employees and the world as a whole. These are organized human groups–legal entities with “rights” and liable for their actions–and they all inflict a sacrilege on humanity. 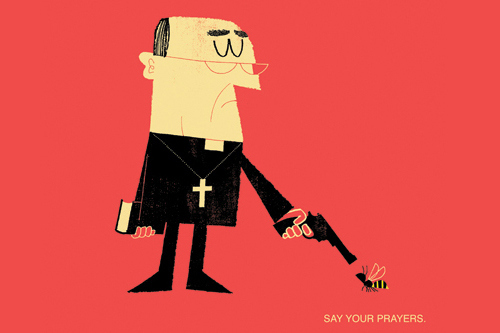 Religious people are not the only ones saying “Say your prayers” as noted in the blog’s graphic. No, its not just religions we need to worry about–and that is why I gave the time to write–CJ, please put the blame where it belongs…its humanity acting in its own self-serving nature as the cause. Blaming religious people is far too narrow and leaves the majority of the guilty outside of the human atrocities you articulated in your blog. Thanks again, my friend.